This page is created for the purpose of helping the family to submit an completed and proofed obituary or life story, that will ONLY be added to the memorial web site of the deceased. ONLY A PROPER AUTHORIZED FAMILY MEMBER SHOULD DO THIS. This page made available by the website administrator. DO NOT CALL THE FUNERAL HOME FOR HELP WITH THIS PAGE. Contact information for this page is below the forms. Also below is a photo or document form. Use this so we can assist you in getting a main photo on the memorial. Additional photos can be directly uploaded by you inside of the memorial. Guides for writing an obituary are below the forms. Once you have finished the final proof of the obituary or life story, return to this page and use the forms below to simply paste the text into, and send to us. If you have it in a document, use the photo/document form to send to us. for errors as it will be posted just as it is sent. If you need to use both forms, refresh page after using one, or if you are submitting multiple items. If you need to speak with someone directly, to help with submission or have a question call 706-590-2650. The information below may or may not apply to how this funeral home processes your obituary, but is provided simply as a guide. There is a difference between a standard obituary, a death notification, and a news or feature obituary. The steps below are a guide for writing a standard obituary. Newspapers almost always charge for an obituary. Death notifications are very brief and usually free. News obituaries are longer stories, usually about well-known or locally known people, chosen and written by the newspaper staff. You can suggest a news obituary about your friend or relative, but the decision to run it is up to the publication. Contact the newspaper(s) where you want the obituary published and ask for their guidelines and sample obituaries. You can include newspapers in locations where your friend or relative spent any amount of time, such as the town where he lived or grew up, or a location where he attended college or regularly vacationed. Placing the obituary in several publications is an easy way to inform people who might otherwise never learn about his passing. Talk to the newspaper about pricing options. Because they charge by length and by the number of days the obituary runs, the cost can be considerable, so decide how much you want to spend. Your payment usually includes placement in both print and online editions, though some newspapers charge extra for this. If you want the obituary to inform readers about the time, date, and location of a memorial service, make sure you know the newspaper's deadlines so the obituary will be published in advance of the service. Before you start writing, gather the facts you'll need. An obituary presents basic information about the person's life and death. It's a good idea to run these facts by other family members to check for accuracy, as well as to make them feel included, before you invest time in writing. Obituaries tend to use a basic, straightforward writing style, simply presenting the facts. Have some samples next to you as a guide -- most newspapers suggest you use recent ones they've published. Optional: cause of death, usually in a brief description such as "died of cancer" or "died after a long illness"
Optional: exact place of death, such as "in the hospital" or "at home"
"Maggie Maples died Saturday at age 98 in her home in Madison, Wisconsin, surrounded by family." "Our loving dad, Stuart Green, passed away in his sleep on July 17 after a heroic fight with cancer. He was 76." "Jeremy Brown died August 28 at age 82 at the Gentle Creek Nursing Home in City, State, where he'd lived for the past six years." Biographical information, including such facts as schools attended, degrees earned, jobs, volunteer experiences, military service, passions, interests, hobbies. "Greta, a 1942 graduate of Our State University, spent most of her professional life as a social worker involved with foster children, a job she loved. After retiring, she volunteered with foster care agencies whenever she wasn't traveling or gardening." "Frank served in the Vietnam War and was a proud U.S. Marine. In his civilian life, he was an electrical engineer and an avid poker player and soccer coach." "Jenny was an active member of her church (name) and a loving wife, mother, and grandmother." "A memorial service will be held on July 1 at 2 p.m. at the Final Rest Funeral Home in XYZ town." "Private services were held last month." Our beloved mom and grandmom, Glydia Henderson, died in her sleep June 30 at the age of 67." "It is with great sorrow that we report the passing of our amazing grandfather"¦"
"Anyone who knew Filbert knew how much he loved playing practical jokes. We will miss his silly sense of humor." Run it by other family members or dear friends to double-check facts. 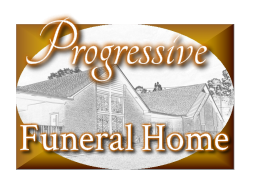 Include ("Condolences can be made at www.Progressivefuneralhome.com") at the bottom, so viewers can leave condolences on their online memorial. Submit it to the newspaper, but always keep a copy. The newspaper will copy-edit for spelling, style, and grammar (but make sure you've also proofed it to the best of your abilities). Ask the newspaper to let you check it before it's printed. If you see a mistake after it's printed, call the paper and ask for a correction. Once you have finished the life story or obituary, you will need to send it to us in the email or form at the top of this page.